WordPress comes with built in user roles and capabilities which allows you to run a multi-author WordPress site. Users can register on your site and create content using WordPress admin interface with limited capabilities. To enable user registration go to Settings » General, check Any one can register next toMembership option. Choose Author or Contributor as the default user role. Users can now register on your WordPress website. To let users know that they can register, go to Appearance » Widgets and drag and drop Meta widget to a sidebar. 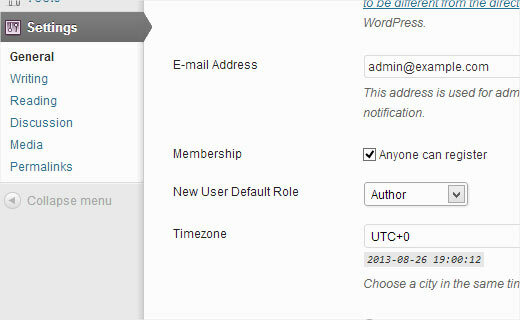 Users can now register and login to your website and use the WordPress admin area to submit their posts and content. They will have limited access to the admin features based on the default user role you chose earlier. You can add or remove capabilities to user roles or create new roles with only the capabilities you want.